The numbers for the UKCS box at i46 are starting to fill up nicely now (23 booked in and at least 3 coming soon - more than i43 already!). The gigantic banner will be returning, we'll be livestreaming the box again, you can get your official UKCS tshirts etc and no doubt we'll find some more stickers from somewhere for i46. First tip, get Silent Image to come, for 2 reasons. First, as stated, he raised the cool factor of the box by a multiple of 20. Secondly, XBOX360 with SF4 and Fifa! Great idea and well said (not about banning Trell though....hmm but then again ;P)! It looks like my clan are finally getting themselves sorted so I'll be with them but it would be good to be able to check in with UKCS too in some way. Drunk and proud you fools! Smogsy even does the Spycrab because that is how he rolls. I'll be bringing a couple of hats with me this year. One I have had for years and another that I got on holiday a couple of years back. And both will be making the trek down to i46 with me. I'm not going to say what they are, you will just have to wait and see what I bring. Saying that, we should all bring hats! 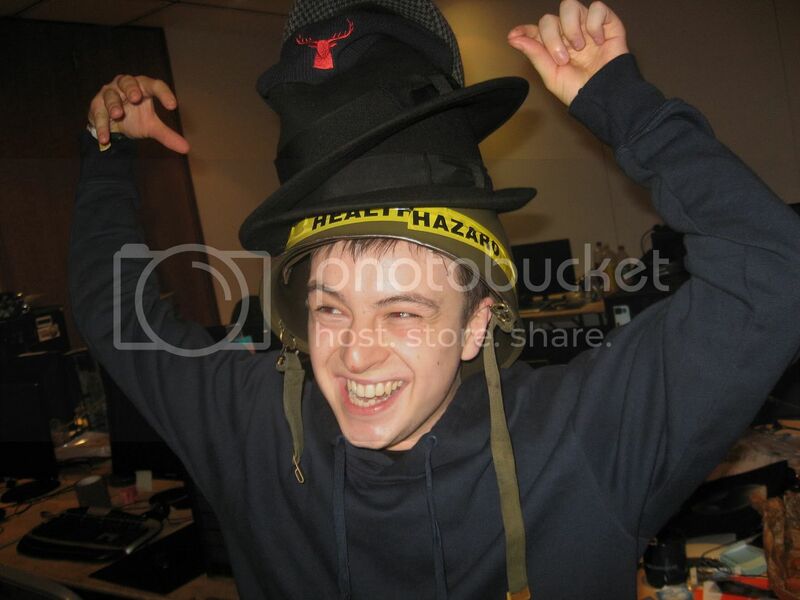 Make it the UKCS Hat Clan Box! The LAN helmet shall be attending (it as been to more i-Series then I fear most UKCS members that are going) but will I bring more? Well that's me bringing my gas mask. Add some grunge and people will start freaking out when we all pair up. Dont worry guys, I have the hat competition nailed. Seriously, it's going to take some beating! Will keep you in suspenders until August. I think I may go for misc items. Gasmask, Bin the Beerbarian, stuff like that. I reckon it be quite cool if we had an inhouse (inclanbox?) gaming tournament of some kind. MittinsKittens wrote: I reckon it be quite cool if we had an inhouse (inclanbox?) gaming tournament of some kind. dod_harringotn, dod_salerno, dod_3xitrainmap, dod_eslarena, dod_bloodarena, dod_dust2, dod_anzio. stock : dod_avalanche, dod_donner, dod_kalt, dod_colmar, dod_jagd, dod_flash, dod_palermo, dod_argentan. I would be up for an in house tournament - TF2 and DoD sounds like a top selection of games to go into that hat.